Candy | Is it vegan? You will probably notice that some of the candy in Japan contains milk. Vegans also need to check for things like honey (蜂蜜 はちみつ hachimitsu OR ハニー hanī), gelatine (ゼラチン) and animal-derived food colouring (e.g. lac/ラック, which is from the lac insect and cochineal (コチニール), also produced from insects). It appears that while bright pinks are often synthetically produced, soft pinks such as the ones in Japanese sweets like daifuku sometimes come from cochineal. Shellac, also from insects, can also be listed on labels as 光沢剤 kōtaku-zai, (food) polisher/brightener, so it isn’t possible to know if that polisher/brightener is vegan without asking the manufacturer. However, there is a lot of interesting vegan candy in Japan (of course there is always a question about whether the sugar was refined using animal bone char and whether the colouring agents were tested on animals). Let’s have a look at some of the common types of candy in Japan. First, one that appears to be vegan, but which isn’t. It contains lac as a colouring agent. • Kasugai Konpeitō/春日井こんぺいとう. Ingredients: Sugar, colouring (lac, yellow 4, yellow 5, blue 1). Photo from website. However, Kasugai does make another variety of konpeito that does not contain lac. Ingredients: Sugar, flavouring, coloring (safflower yellow, paprika pigment, gardenia, red beet). From website: Colorful sugar confection that was transmitted from Portugal in the Muromachi period. You can enjoy 5 tastes (sugar, peach, apples, grapes, cider). Photo from website. According to the manufacturer, in the ball type in the Chocolate Effects series, the shellac is listed as 光沢剤 kōtaku-zai, (food) polisher/brightener, so this product is not vegan. In Japan, some types of candy that would ordinarily contain gelatine contain agar (寒天- kanten) instead. One example is the fruit jellies below. However it seems that many jelly beans made using agar also contain lactose, so are not vegan. • Fruits Up Jelly. Ingredients: Sugar, starch syrup, agar, oligosaccharide, starch, flavouring, colouring (red 102, yellow 4, yellow 5, blue 1, blue 2). Note: It is not known whether the flavouring is vegan. These similar-looking fruit jellies from a supermarket also use agar, but are not vegan because they contain cochineal (コチニール). • Agar Fruit Jellies/寒天フルーツゼリー. Ingredients: Sugar, starch syrup, agar, sorbitol, flavouring, colouring (cochineal, gardenia pigment, safflower yellow), pH adjusting agent. It’s possible to find Skittles from the U.S. in import shops. These were found in an import shop called Carnival. • Skittles Brightside/スキットルズ　ブライト　サイド. Ingredients: Sugar, corn syrup, hydrogenated palm kernel oil, less than 2% of: citric acid, tapioca dextrin, modified corn starch, natural and artificial flavors, colors (titanium dioxide, yellow 5 lake, blue 1 lake, yellow 6 lake, red 40 lake, yellow 6, red 40, blue 1), sodium citrate, carnauba wax. Made in a factory that also handles items containing egg and wheat. Marked “Gluten-free, gelatin-free” in English on the back of the package. Contains palm oil. The five flavours are Paradise Punch (Blue), Kiwi Banana (Yellow), Tangerine (Orange), Watermelon (Green), Pink Lemonade (Pink). • Skittles Original/スキットルズ　オリジナル. Ingredients: Sugar, corn syrup, hydrogenated palm kernel oil; less than 2% of: citric acid, tapioca dextrin, modified corn starch, natural and artificial flavors, colors (Red 40 Lake, titanium dioxide, Red 40, Yellow 5 Lake, Yellow 5, Yellow 6 Lake, Yellow 6, Blue 2 Lake, Blue 1, Blue 1 Lake), sodium citrate, carnauba wax. Marked “Gluten-free, gelatin-free” in English on the back of the package. Contains palm oil. Natural & artificial flavours. 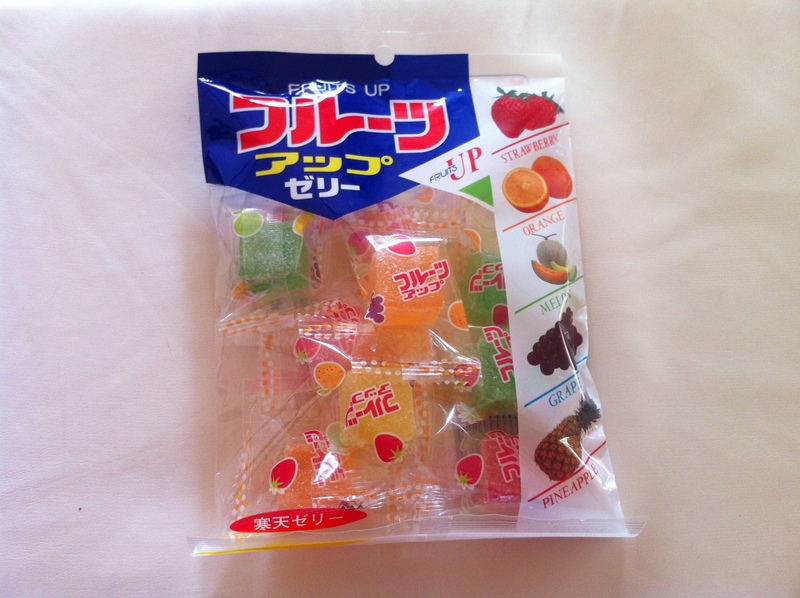 The five flavours are grape, lemon, green apple, strawberry and orange. • Skittles, Tropical/スキットルズ トリピカル. Ingredients: Sugar, corn syrup, hydrogenated palm kernel oil, less than 2% of: citric acid, tapioca dextrin, modified corn starch, natural and artificial flavors, colors (blue 1 lake, titanium dioxide, red 40, blue 1, yellow 5 lake, yellow 5, yellow 6 lake, yellow 6, red 40 lake, sodium citrate, carnauba wax. The five flavours are banana berry, kiwi lime, mango tangelo, pineapple passionfruit, and strawberry star fruit. It appears an older version of this flavour recently had gelatin, so be sure to check the ingredient list before eating. • Skittles, Wild Berry/スキットルズ ワイルドベリー. Ingredients: Sugar, corn syrup, hydrogenated palm kernel oil, less than 2% of: citric acid, tapioca dextrin, modified corn starch, natural and artificial flavors, colors (titanium dioxide, red 40 lake, red 40, yellow 5 lake, blue 1 lake, yellow 5, blue 1, yellow 6, blue 2 lake), sodium citrate, carnauba wax. The five flavours are Berry Punch (violet), Melon Berry (green), Raspberry (blue), Strawberry (pink) and Wild Cherry (red). An older version of this flavour recently had gelatin, so be sure to check the ingredient list before eating. In general, 100 yen shops are a good place to look for candy. Here are just a few of the possibly vegan candies available on a recent trip to Can-do, a popular chain of 100 yen shops. • Dreamy Bean Paste Balls/ゆめのあじ あんこ玉. Ingredients: Fresh bean paste, starch syrup, sugar, maltose, glutinous rice flour. • Kawaguchi Seika Budou-chan Candy/川口製菓　ぶどうちゃんキャンデー. Ingredients: Sugar, starch syrup, dextrin, concentrated grape juice/acidulant, sorbitol, flavour, gelling agent (pectin (from apple)), anthocyanin pigment, red mold-Monascus purpurea pigment, gardenia pigment. Manufactured on the same equipment as products containing milk. • Kawaguchi Seika Lemon-chan Candy/川口製菓　レモンちゃんキャンデー. Ingredients: Sugar, starch syrup, salt, lemon juice, acidulant, flavor, turmeric pigment. • Kawaguchi Seika Meron-chan Candy/川口製菓　メロンちゃんアメ. Ingredients: Sugar, starch syrup, high-fructose corn syrup, melon, starch hydrolyzate/acidulant, flavour, red mold-Monascus purpureus pigment, gardenia pigment, monascus pigment. • Kawaguchi Seika Mikan-chan Candy/川口製菓　みかんちゃんキャンデー. Ingredients: Sugar, starch syrup, mandarin juice, acidulant, flavouring, paprika pigment, turmeric pigment. Uses mandarin juice from Wakayama Prefecture-grown mandarins. Made in a factory that also uses egg, milk, shrimp, crab, soybean, and cashew nuts. • Meito Kuromitsu Matcha Candy/Meito 黒みつ抹茶飴. Ingredients: Sugar (domestically processed), starch syrup, reduced starch syrup, brown sugar syrup, mirin, matcha, vegetable oil, caramel sauce, salt/flavouring, coloring (gardenia), cellulose, antioxidant (vitamin C), acidulant, emulsifier. Uses kokuto, brown sugar from Okinawa, to make kuromitsu, brown sugar syrup. Product does not contain any of the top 27 allergens. • Mixed Dewdrops/しずく玉 ミックスアラカルト. Ingredients: Sugar (domestically processed), starch syrup/acidulant, flavouring, coloring (red mold-Monascus purpureus, gardenia, anthocyanin, safflower yellow), seasoning (amino acids, etc. ), thickener (acacia gum). Produced in a factory that makes products containing dairy, egg, and wheat. The following Okinawan Brown Sugar Candy may be vegan, but the package doesn’t specify what the edible oil is made out of. • Okinawan Brown Sugar Candy/沖縄黒糖飴. Ingredients: Sugar (unrefined sugar), processed brown sugar（raw sugar, brown sugar (50% from Okinawa)), starch syrup, edible oil. Products containing dairy, soba, and peanuts are made in the same factory. Uses kokuto sugar from Okinawa. • Imuraya Kintsuba Yōkan, 1 pc./井村屋 1コ入 きんつばようかん. Ingredients: Sugar, adzuki beans, starch syrup, raw bean jam (adzuki), agar, salt. The same maker of a popular brand of adzuki bean popsicles in Japan also makes this item, a jellied Japanese sweet meant to be sliced and eaten as-is. The following candy from the same Can-Do 100 yen shop is not vegan, because it contains honey/ハチミツ. • Roasted Soybean Flour (Kinako) Sticks/きなこ棒. Ingredients: Roasted soybean flour (not genetically modified), processed brown sugar, starch syrup, reduced starch syrup, honey, oligosaccharides, salt/trehalose. Hi Megan! 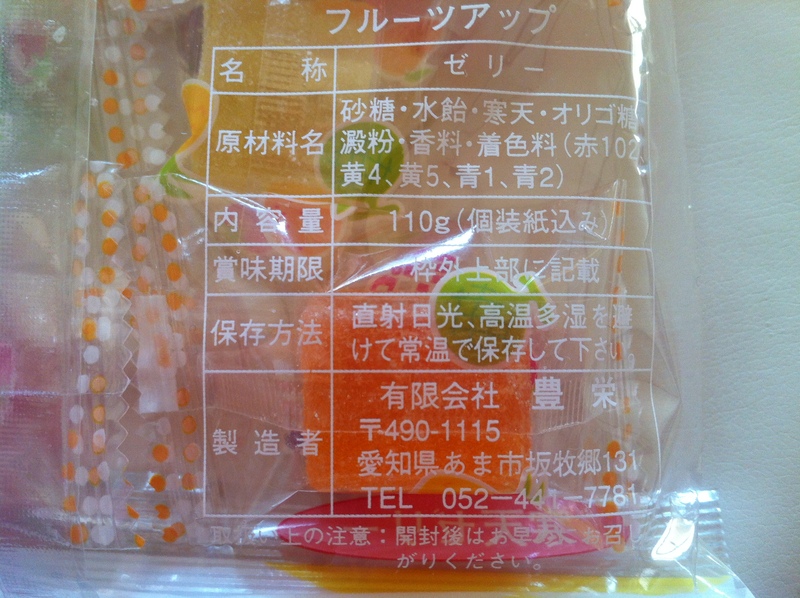 Food labels in Japan often give allergen information, but gelatine is not always included (it is not mandatory, only recommended). There is almost no use of ‘vegan’ or ‘vegetarian’ symbols in Japan either, so unfortunately it is usually necessary to read the list of ingredients. For more information check out: https://isitveganjapan.com/the-basics/reading-food-labels/ Good luck! A “Vegetarian” that eats fish is called a “Pescatarian”. Hello my daughter is very keen to have some of the Japanese sweets that are like kits by Kracie for example one of these kits contains hamburgers little coca cola bottle. Another kit has a donosaur theme.The company that sells them say their products are unlikely to be vegan but I wonder if you could review them so that we know what they do contain. Hello do you know where I can buy the fruits up jellies online? Does Kasugai hard Lychee candy havr dairy or eggs or meat products? Hello! The ingredients are listed online as sugar, millet jelly, acidulant and flavouring. While the sugar may be bone-char processed and the source of the flavourings is unknown, it doesn’t contain any dairy/eggs/meat products that are identifiable from the ingredient list.